Parma, Modena, Bologna – what do all these places have in common? They are all cities with famous foods associated with them in the region of Emilia-Romagna, our next stop on our food tour through Italy. Many, both inside and outside of Italy, would argue that the best of the best in Italian cuisine comes from this region, and in fact, as you read through this post, you’ll see many familiar, spectacular, and delicious items. 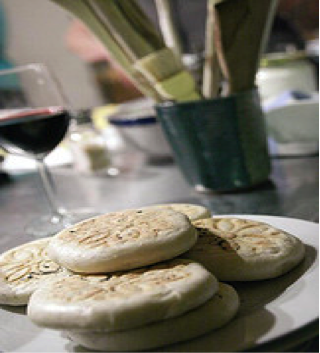 : Two very singular types of bread from Emilia-Romagna are tigelle or crescentine from the city of Modena. Originally, a tigella was made with clay loam from chestnut-growing and water. A dough made with soft wheat, water, milk, brewer’s yeast was put on a hot tigella (the stone), round wooden mould with low relief decorations, such as flowers, and then covered with a dried chestnut leaf. After, the stones are piled up and put in the fire place to bake. : a round thin flat bread made with wheat flour, lard (today, to make this bread vegetarian-friendly, oil can also be used), salt and water. Torta Barozzi: typical of Vignola in the province of Modena, and is deliciously made with dark chocolate, espresso coffee, almonds and vanilla. Traditional Balsamic vinegar comes from Modena. The vinegar is obtained from a crushed grape with is cooked, matures (through slow acidification – natural fermentation) and aged for years in small barrels of different kinds of woods. There is a specific certification process that goes along with grading traditional balsamic vinegar of Modena. Records of the grapes used for the product are checked and the wooden barrels in which the vinegar is matured are inspected and branded when certification is achieved. For more information on Balsamic Vinegar visit http://www.balsamico.it/. 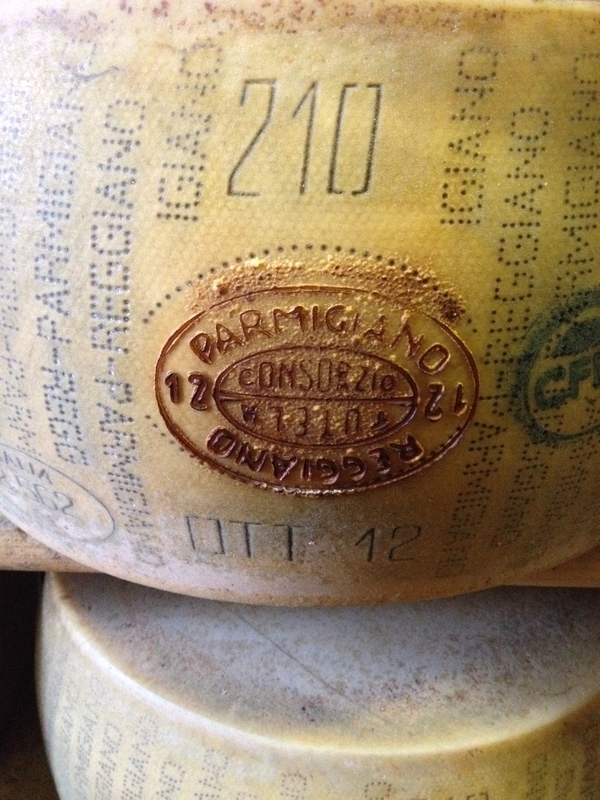 Possibly the most famous cheese from Italy, but maybe the most misunderstood. This delicious hard cheese is made every day, with milk from cows that are fed a very specific diet in a very specific area of Italy. The secrets of making this cheese have been perfected and passed down for hundreds of years, and only the best of the best is allowed to actually be called Parmigiano-Reggiano. Additionally, ricotta cheese (“cooked again”) is made from the byproduct of making Parmigiano-Reggiano. Of course, Emilia-Romagna is the home to the world famous Bolognese sauce, made with ground meat (usually a mixture of beef and pork), vegetables, tomato paste, and a bit of red wine. It is typically served over tagliatelle but other wide, flat noodles can be used as well, and this sauce is also used in lasagne alla bolognese. Emilia-Romagna is quite abundant in their production of cured meats. Coppa – Fully air-dried, thinly cut pork shoulder or neck. Zampone di Modena IGP –First appeared in the town of Mirandola in the early 16th century. Zampone di Modena is a sausage blended with striated muscle fibers, pork fat, pigskin and various seasonings. 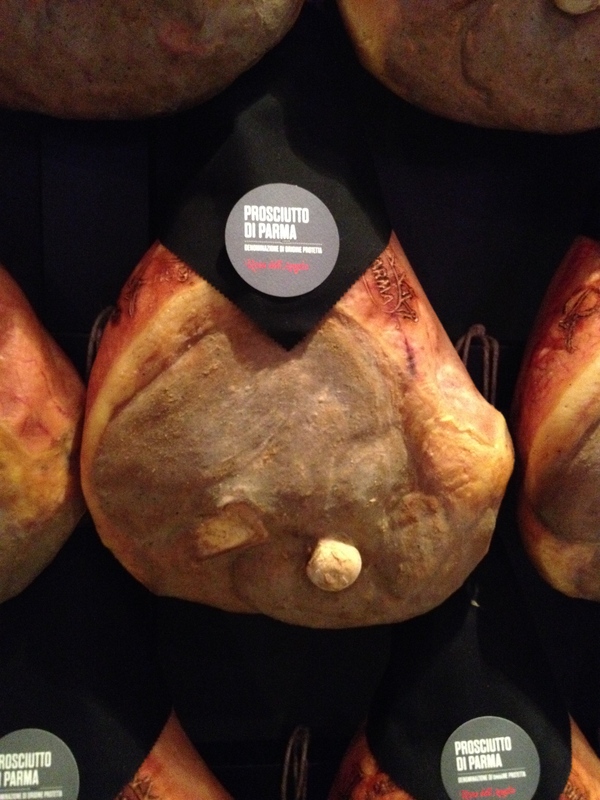 Prosciutto di Parma– The best in the world! Only salt is used in treating the prime, raw hog meat. Prosciutto di Parma is protected by the Consorzio del Prosciutto di Parma; an authentic product can be identified by the mark of a ducal crown. A master butcher hand-trims and inspects each Prosciutto ham. An intensive curing process includes rubbing and salting by hand, followed by long periods of air-drying which typically takes at least ten to twelve months. Prosciutto di Modena DOP This pear-shaped meat has a bright red interior. The flavor is not salty, but distinctly sweet. Pancetta – This salt-cured pork belly is seasoned with nutmeg, pepper, fennel, dried ground hot peppers, and garlic. Cotechino di Modena IGP – Cotechino di Modena is a sausage blended with striated muscle fibers, pork fat, pigskin and various seasonings. Coppa Piacentina DOP – Rural traditions of people from the Po Valley have influenced the evolution of this cured meat, which dates back to Roman times. This type of salami is made from raw, salted, naturally aged pork. The interior of this cylindrical meat is red with pinkish-white spots dispersed throughout. Culatello di Zibello DOP – This salted, eleven month-aged ham comes from the leg of an adult hog. The red meat is peppered with specks of white fat. Extremely strong aroma but with a rather sweet and delicate flavor. Pancetta Piacentina DOP –This soft and sweet meet is bright red and peppered with spots of white fat. Mortadella Bologna IGP –This oval or cylindrically shaped meat has a smooth, inelastic texture and is pink in color. At least 15 percent of each slice is composed of white squares of evenly distributed animal fat. You can search all cured meats on http://www.prosciuttopedia.com or http://garrubbo.com/salumi-italian-cured-meats/.